Our “jazz prodigy” series, part of each year’s Pittsfield CityJAZZ Festival, profiles young artists whom we expect to become part of the “main stage” jazz scene. 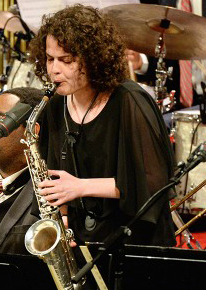 One of the latest to prove us right is our 2013 prodigy, alto saxophonist Zoe Obadaia, who hits the big time with a gig at Dizzy’s Club Coca Cola in New York. August, 2017. Zoe appears with pianist Thomas Linger, bassist Alex Warshawsky, and drummer Zach Adleman. It’s part of the club’s Late Night Sessions, which some of the most talented emerging artists in jazz. The blood drum spirit jazz ensemble will present a concert of original and traditional music in jazz and global traditions on Sunday, May 7, 2017, at 3 pm at St. Stephen’s Episcopal Church at 67 East Street in Pittsfield. It will be to honor and remember those loved ones we have lost through death or separation, notes drummer and leader royal hartigan. The concert is dedicated to Karl Tyler, Clifford Adams, and Mary Ann Knight, a founding member of the Friends of Springside Park. People are invited to bring photos, poems, writings, or other remembrances for display in the church during the concert. The Zion Lutheran Church is collaborating in the support for this performance. A free will offering is requested to assist the churches’ programs. The ensemble will include saxophonist David Bindman, pianist Matan Rubinstein, bassist Wes Brown, and percussionist royal hartigan, with dancer and Pittsfield native Olivia Ilano, who currently resides in the Pioneer Valley. The ensemble has recorded three double CDs and toured throughout the world, including West Africa, Asia, and the United States. A Pittsfield native and professor at UMass Dartmouth, hartigan has recently returned from two years in Ghana, West Africa, as a J. William Fulbright scholar/artist at the Kwame Nkrumah University of Science and Technology in Kumasi. While there, blood drum spirit toured across the country, and performed and recorded with local musicians in numerous villages. The work will be released as a film and CD set entitled We Are One with a focus on the connections among the world’s peoples. For concert information contact royal hartigan at (508) 999-8572 or royaljhartigan@gmail.com. The New England Jazz Ensemble’s first “live” recording, at the inaugural Pittsfield CityJazz Festival, was so successful that the band decided to go live again with its new album. In concert at the Polish National Home theater in Hartford, June 5, 2010. World Premiere of Noah Baerman’s “Know Thyself,” an extended suite for jazz septet, 8pm Friday, November 13 at Crowell Concert Hall, Wesleyan University, Wyllys Ave. Middletown, CT.
Made possible through generous support from Chamber Music America’s “New Works: Creation and Presentation” program, funded by the Doris Duke Charitable Foundation. Grace Kelly, who appeared at the 2006 Pittsfield CityJazz Festival as a guest soloist, and in 2007 as a featured artist, has been named “Alto Saxophone, Rising Star” in the 2009 Downbeat Magazine Critics Poll. Congratulations to this legend-in-the-making! Barbara Dennerlein was interviewed by Jason Crane for The Jazz Sessions before her October 19, 2008 performance during the Pittsfield CityJazz Festival. Barbara Dennerlein – The Jazz Sessions interview. The New Grace Kelly, A Young Jazz Star. Alto sax phenom Grace Kelly, who appeared at both the 2006 and 2007 Pittsfield CityJazz Festivals, has won four 2008 Downbeat Magazine Student Music Awards: Jazz Soloist, Jazz Vocalist, Extended Composition (101), and Arrangement (I Want To Be Happy). Congratulations, Grace! The Don Ellis bio-pic, ‘Electric Heart,’ which made its northeast debut at the Pittsfield CityJazz Festival in 2007, will be shown at the 51st annual Monterey Jazz Festival. We’re honored to have been one of the first venues to screen this film. Congratulations to film maker John Vizzusi and to those who brought this interesting story to the silver screen.